Synthetic peptide conjugated to KLH derived from within residues 500 to the C-terminus of Human Gata6. Human embryonic stem cells differentiated into mesendoderm. 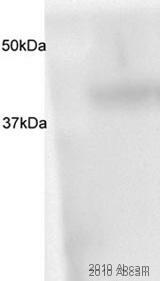 This antibody also gave a positive signal in D3 ES Cells Day 15 EB (Gata6 +ve) lysate. Our Abpromise guarantee covers the use of ab22600 in the following tested applications. WB Use a concentration of 1 µg/ml. 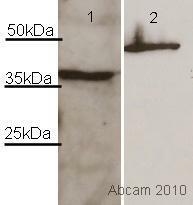 Detects a band of approximately 45 kDa (predicted molecular weight: 45 kDa). Abcam recommends using milk as the blocking agent. Thought to be important for regulating terminal differentiation and/or proliferation. The GATA-type zinc fingers mediate interaction with LMCD1. Additional bands at: 73 kDa. We are unsure as to the identity of these extra bands. 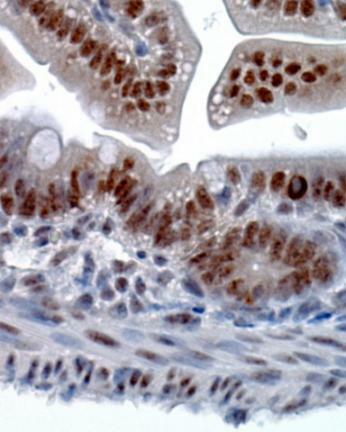 ab22600 staining Gata6 in Human stomach, with strong staining within the glandular cells. Paraffin embedded human stomach was incubated with ab22600 (1/80 dilution) for 30 mins at room temperature. Antigen retrieval was performed by heat induction in citrate buffer pH 6. Publishing research using ab22600? Please let us know so that we can cite the reference in this datasheet. Hi Sir: I attached the questionaire to this E mail. Thank you and hope to hear from you soon. Regards Order Details Antibody code: ab22600 Problem Choose: Non-specific bands Lot number: GR13245 (1MG/ML) Purchase order number: 6026197 or preferably Abcam order number: 983467 General Information Antibody storage conditions (temperature/reconstitution etc) -20 degree centigrade Description of the problem (high background, wrong band size, more bands, no band etc.) Several bands seen, including one around 70 kDa. None at 45 kDa as expected. Sample (Species/Cell extract/Nuclear extract/Purified protein/Recombinant protein etc.) Mouse heart lysate (homogenized) in different amount and early stage embryoid body lysate (sonicated). Sample preparation (Buffer/Protease inhibitors/Heating sample etc.) RIPA(+protease inhibitor tablet) What was the lysis procedure? Mouse heart lysate (homogenized) in different amount and early stage embryoid body lysate (sonicated). Have the samples been reduced and denatured with sample buffer containing SDS and mercaptoethanol by heating for 5 mintues at 95oC? No Have you tried without sonication? Heart sample was homogenised Amount of protein loaded 20- 160 ug. Electrophoresis/Gel conditions (Reducing or Non-reducing gel, % of the gel etc.) 12% gel (Introvirgin) Transfer and blocking conditions (Buffer/time period, Blocking agent etc.) Buffer: in 2ml : 22.5g Glycine 6.06g Tris 400ml Methanol 2gSDS Wet transfer (300mA 200mV) for 6 hours Blocking with 5% milk powder in TBST Primary Antibody (Manufacturer/Species/Diluent/Dilution/Incubation time, Wash step) (1:150) for 16 hours at 4 degree centigrade Secondary Antibody (Manufacturer/Species/Diluent/Dilution/Incubation time, Wash step) Licor:926-32211 IRDye 800CW Goat anti-Rabbit IgG (H + L), 0.5mg Is the secondary antibody working well with other primary antibodies? Yes Detection method (ECL, ECLPlus etc.) Licor-odyssey Positive and negative controls used (please specify) No Optimization attempts (problem solving) Do different dilution of protein How many times have you tried the Western? 50 Have you run a "No Primary" control? No What were the results of the no primary control? Do you obtain the same results every time? Yes No e.g. are the background bands always in the same place? What steps have you altered? Additional Notes: Because I used Gata-6 antibody from Santa Cruz before this one. I cannot get a good signal from that one so I bought this one. I am pretty sure about my skill of western blotting. Thank you for taking the time to complete our questionnaire. The details you have kindly provided will enable us to investigate this case for you and this is also helpful in our records for monitoring of quality. Reviewing this case, I would like to offer some suggestions to help optimize the results from ab22600: 1. I can suggest to reduce and denature the sample by heating to 95oC for 5 minutes with sample buffer containing SDS and mercaptoethanol. The bands observed may be polymers of the protein which will run as single protein when reduced and denatured. Also to run on a reducing gel, to ensure the sample is in the correct conformation to migrate at the correct molecular weight and be detected by the antibody. 2. What are the results of the no primary control? 3. We recommend to load 20 - 30 ug of protein per lane of a gel to ensure it is not overloaded. In the event that a product is not functioning in the applications cited on the product data sheet (and the problem has been reported within 6 months of purchase), we will be pleased to provide a credit note, free of charge replacement or refund. I hope this information is helpful, thank you for your cooperation. Should the suggestions not improve the results, please do not hesitate to contact me again with the further requested details. To whom it may concern: We ordered ab22600 for IHC and western blot and we are getting bands ~64 kDA, ~45 kDA, and ~80 kDA. This seems to be more than expected. Anyone else having a similar experience? We were thinking about ordering Gata6 peptide (ab24410) to confirm, but I can't find any info re: the expected size for this peptide. Is that info available? Thank you for contacting Abcam. From the information on the datasheet for ab22600, the antibody does recognize band ay ~45kDa and also a band about ~75kDa, therefore I am unsure what the other band that you are detecting could be. For the peptide ab24410, it is 17 amino acid fragment from within the C-terminal end. Please let me know is there is anything else I can help you with or if you continue to have issues with ab22600.